Payments Start For N.C. Eugenics Victims, But Many Won't Qualify : Shots - Health News North Carolina forcibly sterilized thousands of people between 1929 and 1976. The state has begun compensating victims, but some who were sterilized may never receive restitution from the fund. Debra Blackmon (left) was sterilized by court order in 1972, at age 14. 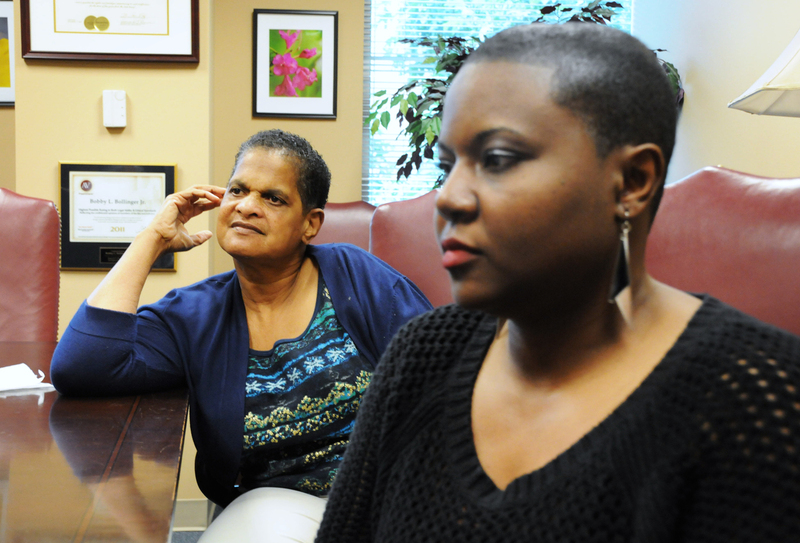 With help from her niece, Latoya Adams (right), she's fighting to be included in the state's compensation program. Debra Blackmon was about to turn 14 in January 1972, when two social workers came to her home. Court and medical documents offer some details about what happened that day. Blackmon was "severely retarded," they note, and had "psychic problems" that made her difficult to manage during menstruation. Her parents were counseled during the visit, and it was deemed in Blackmon's best interest that she be sterilized. Blackmon is among the more than 7,000 people in North Carolina — many poor, many African-American, many disabled — who were sterilized between 1929 and 1976 in one of the country's most aggressive eugenics programs. North Carolina passed a law to compensate victims of the state-run program last year. This week, the state sent out the first checks to qualified applicants. But Blackmon, like many others who are fighting for restitution, is not among them. Blackmon, now 56, has a hard time with the details of that day in 1972 — but she does remember a few things from her trip to Charlotte Memorial Hospital. "My daddy said, 'Don't hurt this baby.' And he was crying," she recalls. Latoya Adams, Blackmon's niece, grew up knowing her aunt had been sterilized. But, she says, "we didn't find out until recently the extent — exactly what all they did to her." After the compensation law passed, she went looking for documentation — and came back with a mother lode: a court order, names of social workers and the entire procedure, outlined from pre-op to discharge. The doctor had labeled it a "eugenics sterilization." And while it was it relief to have the information, she says, it was also remarkably sad. They were telling my grandparents that the surgery was going to be minimally invasive. They told them it would be a tubal ligation. And they [wound] up doing a full abdominal hysterectomy — on a 14-year-old. Latoya Adams, whose aunt, Debra Blackmon, received a "eugenics sterlization" at 14. "They were telling my grandparents that the surgery was going to be minimally invasive. They told them it would be a tubal ligation. And they [wound] up doing a full abdominal hysterectomy — on a 14-year-old," Adams says. With all this evidence, Adams and her family thought they had a case. They filed the paperwork, and waited to hear back. The news wasn't good. "The denial letter, the only thing it really stated was that there were no records found and that her case was not approved by the North Carolina Eugenics Board," Adams says. The problem lies in a technicality. The new compensation law says, to be eligible, operations have to have occurred under the state's Eugenics Board. As it turns out, the board very likely wasn't aware of all the sterilizations taking place. Judges and social service workers were greenlighting sterilizations, as well. "That's kind of become the fundamental problem here," says Bob Bollinger, an attorney representing Blackmon and a few other people who say they are victims. "You have some old dusty filing cabinet in Raleigh that's full of Eugenics Board paperwork from decades ago, but yet you've got all these people who got sterilized involuntarily, where it was instigated at the local level and their paperwork didn't wind up being preserved in the eugenics files in Raleigh — if it was ever there to begin with," he says. Graham Wilson, a spokesman for the North Carolina Industrial Commission, which decides who qualifies for compensation from the $10 million fund, says, "A lot of people may have had this done under the auspices of local county groups. They're not qualified," he says. "They may think they're qualified, and obviously they had this procedure done to them," he says. "But if it was not done under the Eugenics Board of North Carolina, then they're not qualified." Lawyers working with victims estimate hundreds of people — people like Blackmon — could fall into this category. Blackmon's operation was ordered by a judge who was part of the state court system. That judge cited a state law. When asked if that, then, makes the state responsible, Wilson says, "That's kind of hard to say. Again, it's just an unfortunate part of our history. It's just something that was done. So it's kind of hard to say that the state would be responsible when it was just kind of an accepted practice." "It's frustrating sometimes. It really is," Blackmon says. She's not the only one frustrated. Her niece, Adams, says the denial feels like a double blow. "Everything is there, but because you can't find a piece of paper saying it got approved by the North Carolina board, you're not gonna be compensated. I think it's sad. I really think it's sad. It's like, you've hurt her once before, but then now I feel like you're turning around and hurting her once again." There is an appeals process, and Adams and Blackmon are working through that right now. As for people who will be compensated, the first half of the money went out this week --220 checks for $20,000 each. The rest will be disbursed next summer, after the approval process is complete.